House of Hull - Opposing Fans View : "A Chat With The Rovers"
Ahead of the game against Blackburn at the KC Stadium. We got some Blackburn fans' views on their season and the upcoming game. So I set off in search of some Rovers fans willing to answer my questions. My 1st stop was Rivals.net where I was Promptly told to get lost by some guy called �The Judge� ??. So I continued my search and found some friendly posters on the Official Blackburn Message Board. Due to the huge response I’ve decided to give you an answer from a different fan for every question So down to the questions then ! Q. How long have you supported Blackburn and why did you choose the them? Zoe Fisher aka Rovers_girl06 : My first game was a play off final v Leicester at Wembley when I was three years old, believe it or not! My dad bought me my first season ticket a year later. I chose to support Rovers because my whole family are season ticket holders and they are my local team! Q. What do think of your season so far? Pk1875: We have underachieved ,the loss of Bentley and Friedel hit us hard. Together with the inexperience of Ince we’re in for a long hard season. Q. Do you feel the club were right to get rid of Paul Ince? Q. How do you feel big Sam has done since taking charge? Q. Do you think Blackburn will avoid the drop? Bollymcteeth : Yes in the end I think we will. Just! Q. Who do you consider your star player? Q. Which Blackburn player has really surprised you this season and performed above your expectations? Q. Which Blackburn player has really disappointed you this season? Roverthetop :Brett Emerton. It's not his fault, but he’s been played on the right wing where he’s useless, instead of at right back where he’s been excellent for the past two seasons . Now he’s injured , which again isn’t his fault , but is still disappointing. Q. Which player in the Hull side do you think will cause your side Problems? Cranny7: Guess Geovanni is the main man form open play. But from what I've seen of hull, both Geovanni and Dawson look to put a cracking ball in the box, so Turner is a BIG threat!!! Q. What do you think the score will be between Hull and Blackburn? Cookson10: 2-2. Your boys equalising in the last minute. Q. Finally If you could have any Premiership player in your side, who would it be? Re: Opposing Fans View : "A Chat With The Rovers"
Edited 1 time(s). 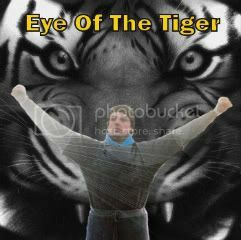 Last edit at 2009:02:27:18:41:09 by Eye Of The Tiger. sometimes you just hav to grit your teeth and be nice to any guest . is it on sky this one?